The 22nd annual Night Lights at Tower Hill Botanic Garden in Boylston, Massachusetts, is truly a one-of-a-kind experience! Whether it's date night or family night, Night Lights has something for everyone. Take a winter wonderland scavenger hunt with the kids, make a romantic stop at the Secret Garden for a magical moonlight scene, and soak in the fragrance of the citrus and subtropical plants in the indoor greenhouses. Here are 9 highlights of the Night Lights experience you won't want to miss. 1) Welcome to a Winter Wonderland! 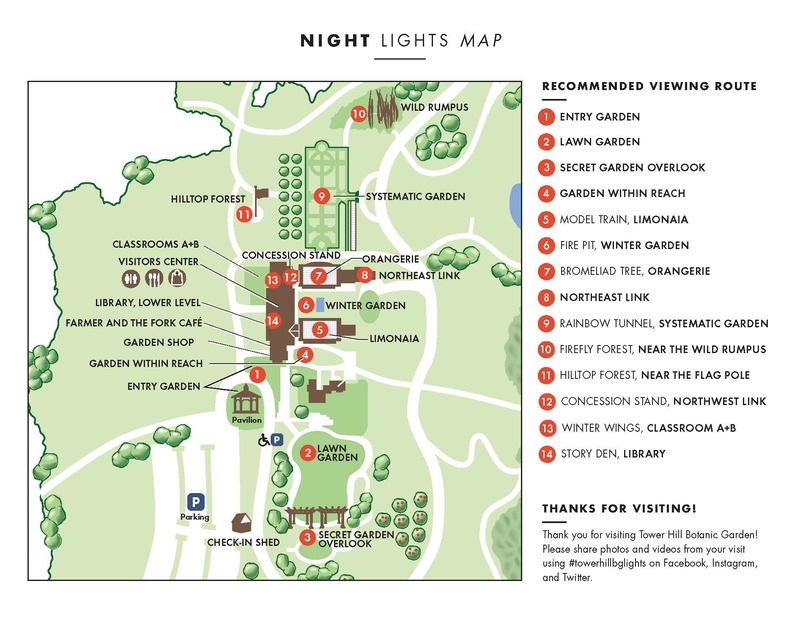 Pre-purchase your tickets (it’s required), park the car, and prepare to be enveloped in the lights of the Entry Garden. Beautiful, colored sparkles will surround you from all angles as you climb the stairs, letting you know you’re entering a special place. You’ll soon notice that Night Lights is a celebration of nature, light, community, and winter’s arrival. 2) Make a quick stop in the Visitors Center to prepare for the journey ahead. For those with children in tow, or the young at heart of any age, request a scavenger hunt from the reception team. The Visitors Center includes restrooms, the Garden Shop and the Farmer and the Fork Café and more. You’ll have an opportunity to further explore indoors before the end of the night. Don’t forget to pick up a map, so you don’t miss a thing. loop. Peek over the railing and into the Secret Garden for a magical moon scene. 4) Go back in time as you walk past the 18th century farmhouse. You can’t miss the botanically-inspired, weathered iron work that marks the entry to the Garden Within Reach and its ancient and inspiring towering ash tree. You might begin to imagine how many people have walked under its branches throughout hundreds of winters passed. 5) Step inside and head into the Limonaia, a large indoor greenhouse, just off of the Visitors Center’s lobby. Soak in the warmth and fragrance of subtropical plants, blooms, and citrus fruits as you make your way to a model train in its alpine forest. You might feel 10 years old again for just a moment. 6) Head back into the lobby and then outside into the Winter Garden where you’ll find a large heated fountain with two spouting eastern box turtle statues. Warm your hands by the firepit and make plans to return later with s’mores ingredients sold at the nearby concession stand. 7) When you cross through the Winter Garden, you’ll re-enter the facilities to experience the Orangerie, a second large conservatory. Close your eyes and use your other senses to be swept away to a jungle-like paradise. Re-open your eyes to spot the towering Bromeliad tree, a large holiday tree form made out of dozens of houseplants that you can grow at home. 8) Upon leaving the conservatory, you’ll pass the concession stand, where you might want to pick up some hot cocoa, warm cider, or adult beverages to carry on your next excursion through the lighted Systematic Garden and its Rainbow Tunnel, the Firefly Forest that is one of many show-stoppers along the route, the stickwork art exhibit, and the Hilltop Forest which by day has views of the Wachusett Reservoir below and by night is covered with winter lights for your enjoyment. 9) Once you’re back inside the Visitors Center there are homemade decorations and discoveries around every corner including a Winter Wings celebration of pollinators and a Story Den celebration of the children’s book The Mitten in the library. You may want to purchase some farm-sourced seasonal food from the cafe before revisiting some of your favorite spots (s’mores at the firepit!). After the enlightening experience, you’ll want to browse the Garden Shop to take a piece of Tower Hill home with you or to stop by the membership table to learn more about how you can make Tower Hill your new four season happy place. Either way, we bet you’ll be making plans to come back soon.